Deputy President Cyril Ramaphosa talks up government at the drop of a hat and sidesteps those uncomfortable questions – sometimes with a smile, sometimes with sarcastic wit. At his first 2017 question time in the House on Wednesday, he faced questions packed with potential political punch – from the looming social security grants payment chaos and state capture to the ANC Youth League’s “fake news” alleging business links to SAA. Ramaphosa bobbed and swayed, and delivered the odd sharp political jab. But what did the politician, who may or not be the next ANC president come the party’s December national conference, actually say? By MARIANNE MERTEN. 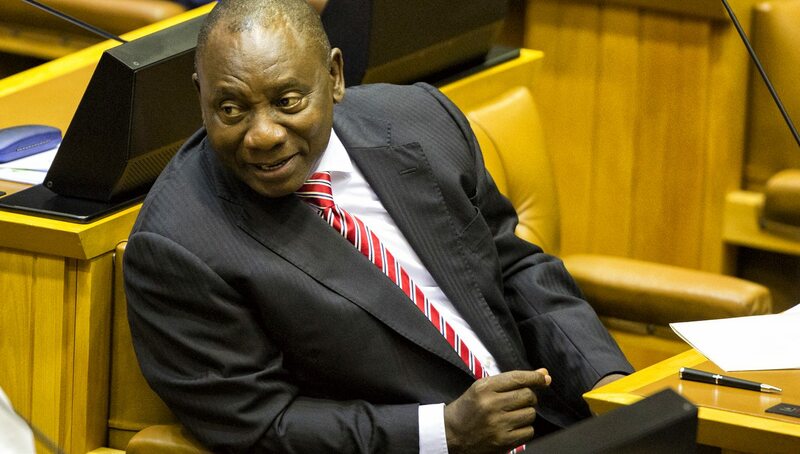 Deputy President Cyril Ramaphosa said he is engaging the ANC Youth League on its “lie” that he has business dealings with SAA, one of the state-owned entities (SOEs) he oversees as chairman of the inter-ministerial SOEs committee. “I told them the matter they raised publicly is a lie, is a fabrication and, as you say, fake news,” he replied to IFP MP Mkhuleko Hlengwa, who had raised the matter, before taking the gap. And he swatted away with a smile DA MP Alf Lees’s follow-up question on SAA board chair Dudu Myeni spending company money to stay in the presidential suite of the five-star Durban hotel that hosted an ANC fundraiser with President Jacob Zuma. The deputy president’s determined good news narrative came into play as IFP MP Liezl van der Merwe pointed out that Social Development Minister Bathabile Dlamini had gone “rogue” amid rising concern that the South African Social Security Agency (SASSA) was unable to pay grants to 17-million vulnerable and poor citizen from April 1 because of departmental inaction to ensure a legally sound service provider was appointed. Ramaphosa’s responses to the unscripted follow-up questions, usually from opposition parties, showcased a determination to emphasise by any means that government is indeed governing – be that in the interests of pensioners and child grant recipients or foreign nationals who have come under threat again in recent days. But he’s not above invoking other processes elsewhere in order not to answer a question, or answering it when it suits him. And so, like the ANC Youth League, Progressive Professionals Forum’s (PPF) Mzwanele Manyi was at the sharp end of a verbal jab. That’s after EFF Chief Whip Floyd Shivambu asked for a response to Manyi’s comments that the “ANC would be broke” if the Financial Centre Intelligence Amendment Bill was adopted. The comments by Manyi, who is widely associated with the “white monopoly capital” narrative fanned in the ANC’s factional battles, were part of a push to scrap the whole Bill during the public hearings after Zuma returned it to Parliament over concerns over warrantless searches by the centre’s inspectors. However, the finance committee only made minor changes to the draft legislation. The Bill, which tightens up anti-money laundering with a focus on politically exposed persons in line with South Africa’s international obligations, was adopted unanimously in the National Assembly on Tuesday. And leaving it to others, like the courts, was also the line used not to answer DA leader Mmusi Maimane’s question on the presence of armed soldiers at February’s State of the Nation Address (SONA). But having dropped the patronising tone used during previous question times, Ramaphosa hauled out folksy accounts involving people he meets to showcase government achievements, even if these are made often against the odds. And so praises were heaped on the “young black woman” pilot, who took off in rainy and stormy weather in Kimberley and delivered passengers, including the deputy president, safely in rain and storms in Johannesburg. The son of Higher Education Minister Blade Nzimande, whom Ramaphosa said he met on an SAA flight between Johannesburg and Durban, was also praised as an example of the young black pilots now working for the national airline. This was not enough, but it was a start, the deputy president said. Ramaphosa is assisted in this approach by the traditional ANC sweetheart questions. Be it on the national minimum wage agreement or “Team South Africa” at the World Economic Forum in Davos, Switzerland, these questions received lengthy, if historical, replies. The Davos question opened the door for a homily to patriotism related to successfully selling South Africa as an investment destination, and yet another stab at the DA. It all revolved around wearing a scarf in the national colours, a space Ramaphosa said no other county had yet claimed. “Wearing that scarf makes the message cohesive… What we were selling was our South Africa, our country… We were not selling a narrow political view,” he told the questioner, DA MP Dean MacPherson, before switching to his mother tongue, Venda. “Now that I said it in Venda I’m sure you will understand better,” he added to chuckles across the House. In the year the ANC goes to its national conference to elect its new set of leaders, Ramaphosa, during Wednesday’s question time, showcased himself as statesman-like, pro-government performance and anti-corruption in proceedings that unfolded without interruption. Ramaphosa, who late last year received the endorsement as ANC president from trade union federation Cosatu, is boxing clever. He has been criticised for not yet having thrown his hat into the ring, but then the ANC frowns on lobbying. But the House is an unmissable platform, like the houses of religion made available to former African Union Commission chairperson Nkosazana Dlamini-Zuma, whom the ANC Women’s League, headed by Bathabile Dlamini, publicly announced as their candidate for the ANC presidency.